If you still have any doubts that mobile devices have taken over our lives, this should make you a firm believer: smartphones and QR codes have become tools of the trade for Chinese beggars. If you’re feeling generous, you can simply whip out your phone, scan a printed QR code and transfer some money to the beggar’s account. Local media have spread news of mobile-savvy beggars in the city of Jinan, in China’s Shandong province. They gather in areas popular with tourists, holding begging bowls that contain a QR code printout. Anyone with Alipay, WeChat Wallet, or some other mobile payment app can scan the code and make a donation. Wait, beggars in China have mobile phones? Well, according to state media outlets, that’s not actually a rare thing. One of the beggars who caught the media’s attention was reportedly a man with mental problems and the QR code he had was made by his family to help him. However, it appears that QR code begging serves other purposes besides generating income for people down on their luck. 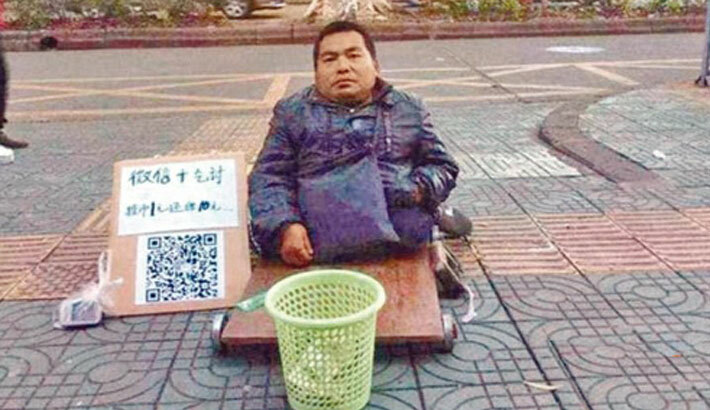 According to digital marketing company China Channel, many beggars in Beijing receive payment from local businesses for every QR code scanned by passers-by. The enterprises use these scans to collect people’s data from WeChat profiles, and then sell the IDs for quite a pretty penny to small businesses. The latter use the information to bombard the users with unsolicited in-app advertisements. Since passers-by don’t actually have to give any money, they are not all that difficult to persuade. However, the “beggars” get paid for their efforts: each QR code scan pays between 0.7 and 1.5 yuan ($0.10 to $0.22). A 45-hour working week nets a monthly average of 4,536 yuan ($685), which is quite decent given what Chinese workers in minimum wage jobs get. The whole thing may sound weird to foreigners, but it must be noted that China is perhaps the country closest to a cashless economy and QR codes are the reason for that. The black-and-white, two-dimensional barcodes are used in all sorts of ways: from payment in shops to tips in restaurants and cash gifts at weddings. In fact, mobile payments in China exceed 50 times the volume for the US, where the 2016 tally was $112 billion.